Mutations in the gene encoding human myocilin (MYOC) have been shown to cause juvenile- and adult-onset glaucoma. In addition, myocilin has been associated with glucocorticoid-induced ocular hypertension and steroid-induced glaucoma. To better understand the role myocilin plays in steroid-induced glaucoma and open-angle glaucoma, we examined rabbit myocilin for use in the rabbit animal model of steroid-induced glaucoma. We have cloned the rabbit ortholog of human MYOC. 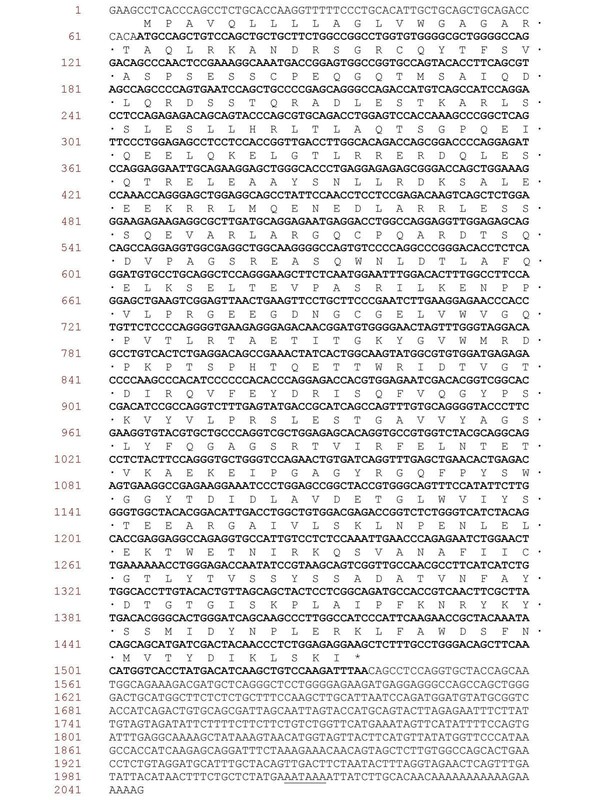 Rabbit MYOC consists of three exons and an open reading frame encoding a 490 amino acid, 54,882-Da protein, which is 14 amino acids shorter at the N-terminus than human myocilin but 84% identical overall. Rabbit myocilin migrates as a single electrophoretic band, vs. double-banded human myocilin, by SDS-PAGE/immunoblot analysis. We determined that the differential migration exhibited is due to an N-glycosylation site that is present in human (Asn57), monkey and mouse myocilin but absent in rabbit (Ser43), rat and bovine myocilin. Rabbit myocilin is secreted in vitro in trabecular meshwork cell culture and in vivo in aqueous humor. Secretion of human myocilin is shown to be dependent on the signal peptide and independent of the extra 14 amino acids not found in rabbit myocilin. Many of the amino acids in myocilin that are mutated in glaucoma patients are conserved across species. We have cloned the rabbit MYOC cDNA and determined that rabbit myocilin is secreted but not N-linked glycosylated. Knowledge of the rabbit MYOC cDNA sequence will facilitate future studies in the rabbit animal model examining the role of myocilin in steroid-induced glaucoma and the gain-of-function hypothesis in open-angle glaucoma. Mutations in MYOC have been shown to be causative for primary open angle glaucoma (POAG) [1–3]. Glucocorticoids have been implicated in ocular hypertension and glaucoma due to increased plasma cortisol levels [4, 5] and altered cortisol metabolism [6, 7] in POAG patients and from the increased risk of developing POAG in steroid-responsive patients [8, 9]. Myocilin has been shown to be upregulated in glucocorticoid-treated human trabecular meshwork (TM) cells [10, 11], and there is variable evidence for increased MYOC expression in glaucomatous individuals [12–14]. In addition, glaucoma patients have a higher chance of responding to steroids than non-glaucomatous individuals. However, an extensive study of mutations in the proximal promoter and coding region of MYOC found no sequence polymorphisms associated with steroid responsiveness . Myocilin has been shown to be secreted both in human TM cell cultures and in vivo in aqueous humor (AH) . Glaucomatous mutations, however, alter myocilin Triton solubility  and prevent myocilin from being secreted . The glycosylation status of myocilin is somewhat controversial. Several groups have shown that myocilin is glycosylated [10, 16–21] whereas one group suggests that myocilin is not glycosylated . In our hands, both an N-linked glycosylated (≈57-kDa) and unglycosylated (≈55-kDa) form of myocilin is detected in TM cell culture media  and aqueous humor . The basis for both secretion and N-linked glycosylation of myocilin is part of the focus of this paper. Rabbits have been successfully used as a model of glucocorticoid-induced ocular hypertension [23–27]. In order to study the association of MYOC gene expression with steroid-induced ocular hypertension, it will be helpful to know the sequence of rabbit myocilin. We report here the cloning, sequence comparison and expression analysis of rabbit MYOC. We show that an N-terminal signal peptide is necessary for myocilin secretion and we identify the N-linked glycosylation site found in human but not rabbit myocilin. We have cloned a 2-kb cDNA for rabbit MYOC that encodes a 490 amino acid, 55-kDa protein with a calculated pI of 5.25 (Fig. 1). Rabbit myocilin amino acid sequence is 84% identical to human myocilin  and highly homologous across species (Table 2) with an overall 64% homology. Rabbit myocilin is 14 amino acids shorter at the N-terminus than human myocilin and the same length as monkey , mouse [29, 30], and bovine  myocilin (Fig. 2). As in all myocilin orthologs cloned to date, rabbit myocilin contains a leucine zipper motif (aa 103 to 152) (Fig. 2). A potential peroxisomal targeting signal is encoded on the C-terminus (SKI, aa 488–490). Unlike human, monkey and mouse myoclin, rabbit myocilin does not contain a consensus N-linked glycosylation site (N-X-S/T; human, aa 57–59; monkey, aa 43–45; mouse, aa 43–45) (Fig. 2). The nucleotide sequence for rabbit MYOC reported in this manuscript has been submitted to GenBank (AY191317). Rabbit MYOC Sequence. Nucleotide and deduced amino acid sequence of rabbit MYOC cDNA. Open reading frame nucleotides are shown in bold. Encoded amino acids are shown by single letter code and the stop codon is indicated with an asterisk. Numbers to the left indicate nucleotide position. The consensus polyadenylation signal (AATAAA) is underlined. Alignment of myocilin orthologs. Alignment of rabbit, human, monkey, mouse, rat, and bovine myocilin amino acid sequences. Identical amino acids are shaded and missing amino acids are indicated with a dash. The 14 amino acid deletion in human MYOC plasmid pcDNA3.hMYOC.ΔN14 is underlined. The putative myocilin signal peptide is boxed. Location of the predicted N-linked glycosylation site (human myocilin Asn57) is indicated with a 'n'. Locations of predicted O-linked glycosylation sites are marked with an 'o'. The leucine zipper motif is marked by dots. Disease-causing mutations identified based on experimental data and statistical arguments with glaucoma family pedigrees and documented in the Human Gene Mutation Database http://uwcmml1s.uwcm.ac.uk/uwcm/mg/search/5584221.html are indicated with a 'x'. GenBank accession numbers are as follows: rabbit, AY191317; human, NM_000261; monkey, AY190128, AY190129, AY190130; mouse, AF039869; rat, AF093567; bovine, AB027758. Rabbit, monkey, mouse and bovine myocilin open reading frames begin at amino acid 15 relative to human myocilin. The function, if any, of the extra N-terminal 14 aa encoded by human myocilin is not presently known. Rat myocilin also contains an extra 13 aa N-terminal sequence . To determine if rabbit myocilin is secreted despite the absence of the additional human-like N-terminal 14 aa, we examined rabbit aqueous humor. We were able to detect myocilin in rabbit aqueous humor (Fig. 3A). This suggests that the human N-terminal 14 aa is dispensible for secretion and that the rabbit myocilin sequence is sufficient to direct secretion. Rabbit MYOC expression. 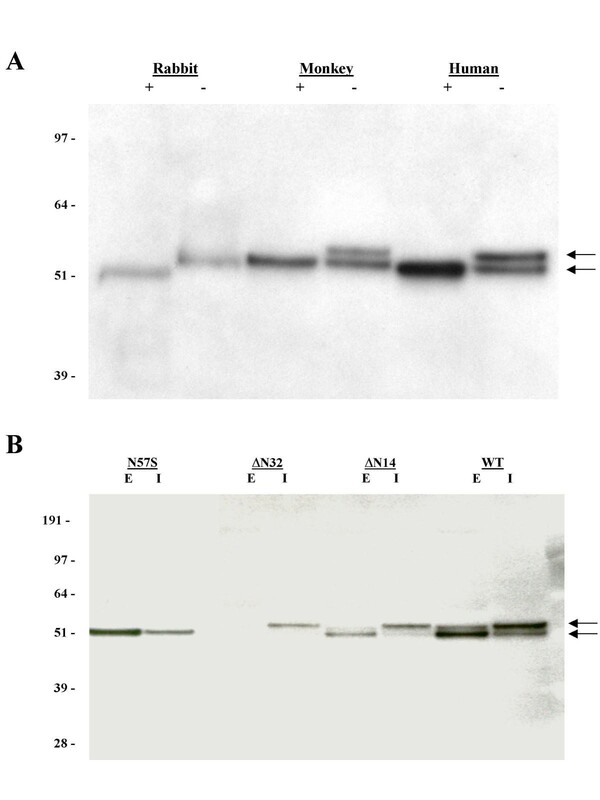 Western immunoblot analysis of myocilin in (A) rabbit, human, and monkey aqueous humor samples treated with (+) or without (-) glycosidases and in (B) GTM66 cells transfected with expression vectors encoding wild-type human MYOC (WT), N-terminal 14 (ΔN14) or 32 (ΔN32) aa deleted human MYOC, or N57S mutated human MYOC. I, intracellular myocilin present in the cell lysate; E, extracellular myocilin secreted into the medium. 57/55-kDa myocilin doublet is indicated with arrows. Next we created a human myocilin expression construct where the N-terminal 14aa were deleted (pcDNA3.hMYOC.ΔN14) forcing translation to begin at the second methionine codon (Fig. 2). GTM66 cells were chosen for this study based on their ability to grow and transfect well and are a glaucomatous TM cell line derived from a 92-year-old female donor [11, 17]. Transfection of GTM66 cells with the N-terminal deletion mutant resulted in a distribution pattern similar to wild-type human myocilin (Fig. 3B). The fact that we see no discernable difference in the relative mobility between transfected human wild-type myocilin and 14 amino acid amino-terminal deleted myocilin (Fig. 3B) and human vs. monkey myocilin in AH (Fig. 3A) may be due to the use of small format gels or possibly to the usage of the second N-terminal methionine by the cell for synthesizing human myocilin, making human and monkey molecular weights comparable. Nonetheless, an N-terminal signal peptide is likely necessary for directing synthesis of myocilin, via the ER-Golgi pathway, for secretion outside the cell. To determine what actually constitutes the signal sequence for myocilin, we conducted an analysis of signal peptide cleavage sites using the Center for Biological Sequence Analysis SignalP v1.1 Database http://www.cbs.dtu.dk/services/SignalP/. A signal peptide cleavage site was predicted to exist between rabbit aa 18 and 19 (human aa 32 and 33) . We directly tested the importance of the signal peptide in myocilin secretion by replacing the first 32 aa of human myocilin with a single methionine (pcDNA3.hMYOC.ΔN32). Transfection of GTM66 cells with pcDNA3.hMYOC.ΔN32 resulted in intracellular but not extracellular myocilin distribution (Fig. 3B). This is the result expected if the signal peptide were necessary for secretion. This suggests that the first 18 aa of rabbit myocilin may function as a signal peptide and are necessary for myocilin secretion. Human myocilin has been shown to migrate as a 55/57-kDa doublet by SDS-PAGE/immunoblot analysis [10–12, 16, 17]. The modification accounting for this molecular weight difference is hypothesized to be due to differential glycosylation. N-linked glycosylation sites were predicted using the Center for Biological Sequence Analysis NetNGlyc 1.0 Prediction Server http://www.cbs.dtu.dk/services/NetNGlyc/. Human, monkey and mouse myocilin contain a consensus asparagine (N)-linked glycosylation site (NES) near the N-terminus, whereas rabbit, rat and bovine code for SES at this position (Fig. 2). Having a serine present at this position would eliminate N-linked glycosylation and would be predicted to result in a difference in relative gel mobility between human/monkey and rabbit myocilin. To test this hypothesis we analyzed human, monkey, and rabbit AH myocilin side-by-side in SDS-PAGE/immunoblots. The anti-human myocilin antibody 129 used in these studies (generated to human amino acids 156–171[12, 17]) cross-reacts with rabbit and monkey myocilin. With human and monkey myocilin we see a clear doublet, whereas rabbit myocilin migrates as a single band with the same relative mobility as the lower band of human and monkey myocilin (Fig. 3A), suggesting that the asparagine vs. serine amino acid difference is responsible for the differential glycosylation. To directly test this theory, we mutated human myocilin amino acid 57 from Asn to Ser, as found in rabbit myocilin. Media and cell lysate from transfected GTM66 cells contained a single immunoreactive myocilin band that migrated with the same relative mobility as the lower wt myocilin band (Fig. 3B). This suggests that the 55/57-kDa human myocilin doublet is due to differential glycosylation and that the site of N-linked glycosylation on human myocilin is Asn 57. To determine the effects of deglycosylation on myocilin, we treated human, monkey, and rabbit AH with a cocktail of glycosidases (N- and O-linked). Our results show that the upper band of human and monkey myocilin is eliminated whereas the lower band remains unaltered (Fig. 3A). This indicates that the upper human and monkey myocilin band is glycosylated. In addition, the single rabbit myocilin band shifted downward slightly with deglycosylation. This may be due to removal of O-linked glycosylation. We report the cloning and characterization of rabbit myocilin. Rabbit myocilin is highly similar to the other myocilin orthologs (Table 2) and contains a leucine zipper motif encoded by exon 1 (Fig. 2). This conservation likely reflects the importance of the leucine zipper motif in directing protein-protein interactions [34, 35]. Many amino acid mutations encoded in the olfactomedin homology domain of exon 3 that are known to cause glaucoma in humans are also conserved in rabbit myocilin. In fact, all 31 amino acids (34 missense/nonsense mutations total) for human myocilin documented in the Human Gene Mutation Database http://uwcmml1s.uwcm.ac.uk/uwcm/mg/search/5584221.html to cause glaucoma are conserved in rabbit myocilin (Fig 2). Myocilin has been shown to be secreted in vitro and in vivo by several investigators [10–12, 20, 21, 34, 36–38]. Secreted proteins typically contain a 16–30 aa signal sequence on their N-terminus which directs the completion of protein synthesis across the ER membrane. A signal peptidase cleaves the signal sequence and the trimmed protein is shuttled through the Golgi for secretion. We demonstrate the functionality of the N-terminal signal peptide in directing myocilin secretion. Deletion of the predicted N-terminal signal peptide results in loss of secretion but not intracellular appearance (Fig. 3B). There are conflicting reports on whether myocilin is glycosylated. Differential glycosylation of myocilin has been shown in this report and by others [17, 20, 21] to account for the appearance of a 55/57-kDa doublet by Western immunoblot analysis. In contrast, Huang et al. report that myocilin is not glycosylated. This discrepancy may be due to technical reasons. Huang et al. did not resolve the 55/57-kDa doublet using their SDS-PAGE system and only detected a 57-kDa human myocilin band, so any deglycosylation (PNGase F, NANase II, and O-Glycosidase) occurring would be difficult to resolve. A positive control was not reported in their deglycosylation experiment, so their conclusion that myocilin is not glycosylated may simply be due to inactive glycosidase. The lack of glycosylation seen in the in vitro canine pancreatic microsomal membrane translation experiment may again be due to poor 55/57-kDa myocilin doublet resolution or the inability of this artificial system to faithfully glycosylate myocilin. However, Caballero et al. was able to detect deglycosylation affects using similar methodology . Nguyen et al. identified a 66-kDa band as the glycosylated and major extracellular form of human myocilin and not the upper band in the 55/57-kDa doublet. These authors claim that the lower band of the unglycosylated 55/57-kDa doublet is due to cleavage of the N-terminal 32 amino acid signal peptide. In our hands, we do not see a 66-kDa band on our anti-myocilin Western blots, even using human aqueous humor as a source of myocilin. We provide evidence that the upper band of the 55/57-kDa doublet is the glycosylated form of myocilin (Fig. 3A). Another group has also reported the 66-kDa band using an anti-myocilin antibody different from the Nguyen et al. antibody . The reason for the appearance of this 66-kDa is unclear, but may be due to cross-reaction of the primary or secondary antibody with another protein such as albumin, which has a molecular weight of 65-kDa (GenPept accession # NP_000468). To date, protein sequence data identifying the 66-kDa band as myocilin has not been reported. Human myocilin Asn57 is part of an N-linked glycosylation consensus (NES) and is the only residue on myocilin predicted to be N-glycosylated. We provide both site-directed mutagenesis (Fig. 3B) and deglycosylation (Fig. 3A) evidence that the upper band of the 55/57-kDa human and monkey myocilin doublet is the glycosylated form. The increase in mobility of rabbit myocilin with deglycosylation (Fig. 3A) is likely due to removal of O-linked glycosylation. 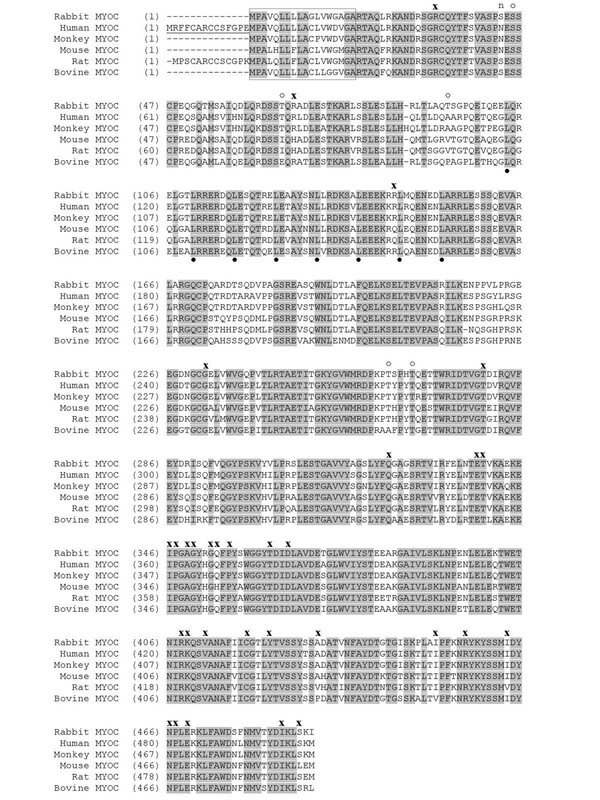 Analysis of O-linked glycosylation by the CBS NetOGlyc 2.0 Prediction Server http://www.cbs.dtu.dk/services/NetOGlyc/ identified two unique (rabbit Thr93 and Thr267) and three common (rabbit Thr66, Thr263, and Ser45) O-linked glycosylation sites in rabbit vs. human/monkey myocilin. The additional O-linked glycosylation sites in rabbit may be responsible for the mobility shift seen in the deglycosylation experiment and the relative diffusiveness of the rabbit myocilin band. A naturally occuring Asn57Asp polymorphism may be associated with JOAG  which, if truly disease-associated, would suggest the functional importance of N-linked glycosylation. N-linked glycosylation is known to confer stability on many extracellular proteins . Myocilin is similar to fibronectin (an extracellular matrix protein) in that both a glycosylated and unglycosylated form is secreted from the cell. The unglycosylated form of fibronectin is more susceptible to proteolytic degradation than the glycosylated form . It will be interesting to determine why two forms of myocilin are secreted in humans and what functionality, if any, N-linked glycosylation imparts on human vs. rabbit myocilin. It is still unknown how myocilin functions normally and pathophysiologically. However, recent evidence suggests that disease-causing myocilin mutations are gain of function. Disease-causing myocilin mutants are less soluble in Triton  and are retained by the cell . Other studies have shown that a truncated form of myocilin does not get secreted [20, 21] and that mouse MYOC knockouts are without discernable phenotype . Furthermore, a human hemizygous individual containing an interstitial deletion of chromosome 1, which encodes MYOC, was without evidence of glaucoma  and another patient homozygous for a severly truncated form of myocilin had no evidence of glaucoma  or other discernable phenotypes. This suggests that MYOC haploinsufficiency is not causative for glaucoma and that myocilin may even be dispensable or redundant in normal human development or only important when ocular stress occurs. Rabbit MYOC encodes a protein highly similar to human MYOC. Rabbit myocilin is secreted and is detected in rabbit aqueous humor. Secretion of myocilin is dependent on an 18 amino acid N-terminal signal peptide. Unlike human and monkey AH myocilin, rabbit myocilin does not undergo canonical N-linked glycosylation due to the substitution of a serine in the analogous human N-linked glycosylation site (N57). Rabbits may provide an in vivo system for modeling some aspects of glaucoma, such as steroid induced ocular hypertension [23–27] and the gain-of-function hypothesis in POAG . Total RNA was extracted from rabbit eye and heart tissue (Pel Freez) using Trizol (Invitrogen). Primers derived from conserved regions of human and mouse MYOC (Table 1, primers Exon1F/Exon1R) were used to amplify a 250-bp section of rabbit MYOC exon 1 (Fig. 1, nts 184–433) by PCR as described . 5' and 3' RACE (Invitrogen) was used to obtain the 5' and 3' cDNA ends. Essentially, two micrograms rabbit total RNA was converted into first strand cDNA with adapter primer and Superscript II reverse transcriptase. Primary and nested 5' and 3' RACE primers were all designed within the 250-bp region of rabbit MYOC exon 1 (Table 1). PCR products were subcloned into TOPO™ TA cloning vectors (Invitrogen) and subjected to cycle sequencing (Division of Molecular Transport, Department of Internal Medicine, University of Texas Southwestern Medical Center). Due to difficulties in amplifying the rabbit MYOC coding region from cDNA, we pieced together the entire contiguous open-reading frame using rabbit genomic DNA (Clontech; New Zealand White) as a template with a multi-step PCR/ligation process. In the first step, exons 1 and 2 were amplified from genomic DNA with primers P357F/P368R to exon 1 and P355F/P365R to exon 2. Primers P368R and P355F directly abut each other at the exon 1/2 boundary. PCR amplification was performed in a 50 ul volume with the PfuTurbo Hotstart DNA Polymerase system (Stratagene) and included 0.2 mM dNTPs, 100 ng each primer, 2.5 units PfuTurbo DNA polymerase, 100 ng genomic DNA, and 1X cloned Pfu DNA polymerase reaction buffer. Cycling conditions consisted of 2 min at 95°C followed by 15 cycles at 95°C 30 sec, 60°C 30 sec, and 72°C 1 min in a Perkin Elmer 9700 thermalcycler. PCR products were restriction digested with BamH1 (exon 1) or Not1 (exon 2), purified from an agarose gel by Qiaquick extraction (Qiagen), and simultaneously subcloned into a BamH1/Not1 digested pcDNA3 (Invitrogen) vector to create a directional clone of rabbit MYOC exons 1 and 2 spliced together (pcDNA3.RbMYOCex1–2). Sequence integrity of the cloned DNA was verified by cycle sequencing and restriction digestion. Exons 1–2 of plasmid pcDNA3.RbMYOCex1–2 was then amplified with primers P357F/P370R and exon 3 was amplified from genomic DNA with primers P356F/P356R. Primers P370R and P356F directly abut each other at the exon 2/3 boundary. PCR was performed as above and PCR products digested with BamH1 (exons 1–2) or Not1 (exon 3) and processed/cloned as above to create a directional clone of rabbit MYOC exons 1–2 and 3 spliced together (pcDNA3.RbMYOCex1–3). Plasmid DNA integrity was confirmed by restriction analysis and cycle sequencing. Alignment of DNA sequence contigs, protein sequences, and plasmid DNA sequence/construction was performed with Vector NTI 7.1 software (Informax). Human MYOC cDNA was cloned into the pcDNA3 (Invitrogen) mammalian expression vector as described . Human myocilin signal sequence deletions were generated by PCR. A 5' PCR primer, with a 5' HindIII site added, was designed to eliminate either the first 42- (P235; ΔN14) or 96- (P236; ΔN32) nucleotides of the human MYOC ORF and used in conjunction with a 3' PCR primer (P237) covering the internal Bsu36I restriction site (Table 1). Primer P236 replaced the first 32 amino acid codons with a methionine codon. PCR and processing were as described above with the exception that the 5' human MYOC deletion products were cloned into a HindIII/Bsu36I digested pcDNA3.hMYOC wild-type vector. Substitution of human myocilin Asn 57 with Ser was accomplished using the QuickChange XL Site-Directed Mutagenesis kit (Stratagene) according to the manufacturer's instructions. Primer pair P316F/P316R was designed to replace the Asn57 AA T codon with the Ser AG T codon (Table 1). The entire mutated cDNA was sequence verified and subcloned into a fresh pcDNA3 vector to avoid non-specific Taq DNA polymerase errors. Proper cloning was verified by restriction digestion analysis and sequencing. GTM66 cells were derived from a 92-year old woman with glaucoma and were cultured in low glucose DMEM (HyClone Laboratories) with 10% FBS (HyClone Laboratories) and antibiotics (Invitrogen) as described [11, 17]. Cells were transfected with Lipofectamine 2000 reagent according to the manufacturers recommendations (Invitrogen). Transfected plasmid DNA included wild-type human MYOC (pcDNA3.hMYOC; ), wild-type rabbit MYOC (pcDNA3.RbMYOC.ex1–3), N-terminal 14 amino acid deleted human MYOC (pcDNA3.hMYOC.ΔN14), N-terminal 32 amino acid deleted human MYOC (pcDNA3.hMYOC.ΔN32), or N57S human MYOC (pcDNA3.hMYOC.N57S). Cells were switched to serum-free media 24 h post-transfection and media or cell lysates were collected after overnight incubation. Equivalent cell lysate protein amounts (5 μg) were loaded for reduced SDS-PAGE analysis (Fig. 3B). Cell media was not concentrated and was loaded at 16 ul per lane in Fig. 3B. All experimental animals used in this study were treated in compliance with the Association for Research in Vision and Ophthalmology (ARVO) resolution on the use of animals in research. Rabbit aqueous humor samples (135–190 μl) were taken from anesthetized New Zealand Albino (NZA) rabbits and mixed with protease inhibitor cocktail (Complete; Roche) to prevent myocilin degradation. Human aqueous humor samples were obtained as previously described . The equivalent of 4 μl AH was used per lane in Fig. 3A. Cells were rinsed with PBS and solubilized in a commercial mammalian extraction buffer (M-Per™; Pierce, Rockford, IL) supplemented with a protease inhibitor cocktail (Complete; Roche) followed by centrifugation at 12,000 × g for 5 min. Protein concentration of the supernatant was determined with Coomassie Plus Protein Assay Reagent (Pierce). Cell extracts were stored at -20°C. Aqueous humor, cell media, and cell extracts were analyzed using pre-cast Criterion 7.5% Tris-HCl polyacrylamide gels (Bio-Rad) and the Bio-Rad electrophoresis system (Bio-Rad). Proteins were electroblotted to Hybond-P PVDF membranes (Amersham Pharmacia Biotech), blocked with gelatin, and probed with affinity purified rabbit anti-human myocilin antibody 129 (AB129; generated to human myocilin amino acids 156–171) [12, 17] and an anti-rabbit IgG secondary antibody (Amersham). Immunoreactivity was detected with the ECL Plus detection system (Amersham). Blots were exposed to BioMax MR film (Eastman Kodak) and scanned with a HP ScanJet 7400 c scanner (Hewlett Packard). Aqueous humor from human, monkey and rabbit was subjected to deglycosylation with a mixture of N-linked and O-linked glycosidases (PNGase F, sialidase, β-galactosidase, glucosaminidase and O-glycosidase) using the Enzymatic CarboRelease Kit according to the manufacturers instructions (QA-Bio). AH samples in buffer were boiled for 5 min in the presence of denaturant followed by incubation for 3 hr at 37°C with the glycosidase mixture. NuPAGE sample buffer (Invitrogen) was added to stop the reaction, samples were heated for 10 min at 70°C and subjected to NuPAGE electrophoresis on 10% NuPAGE gels (Invitrogen). Samples were transferred to PVDF, immunoblotted versus AB129, and developed using ECL Plus. This work was supported by NIH grant RO1-EY-10564 (ES) and Alcon Research, Ltd. ES is an Investigator of the Howard Hughes Medical Institute. AS carried out the clone isolation and characterization, sequence comparison, plasmid construction, and drafted the manuscript. NJ carried out the cell culture, transfections and immunoblot analyses. RS generated preliminary sequence data for rabbit MYOC and a preliminary manuscript draft. TS provided computer analysis/modeling of myocilin. AL oversaw the work of RS. ES oversaw the work of AL and RS. AC conceived of the study, helped draft the manuscript, and oversaw the work of AS, NJ, and TS.